During the changing of the seasons the Las Vegas Valley can get hit with storms and unfortunately some of those storms include hail. The spring and fall can bring in nasty weather can damage your property and vehicles. 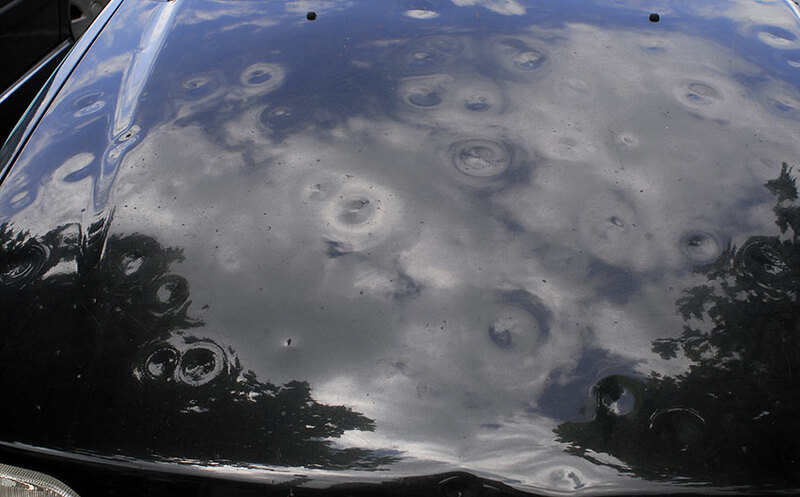 When hail strikes the vehicles on the road or left outside are sometimes hit with the worst amount of damage. Tucker’s Collision Center understands that hail damage repair needs to be cost-effective while making your vehicle look brand new again. Get a free estimate for vehicle hail damage repair in Las Vegas Valley from us. Tucker’s Collision Center utilizes paintless dent repair that restores your vehicle cosmetically without the need to repaint. With over 20 years of hail damage repair experience, Tucker’s Collision Center give you unmatched quality by our expert technicians. The pride in our work has shown over the years and we have a great reputation that we work hard to maintain with every new customer or job. What is the paintless dent repair that we use for hail damaged vehicles in the Las Vegas, NV area? The art of removing dings and dents caused by hail damage without using paint or fillers is called paintless dent repair. We use specialty tools that remove the hail damage without harming your vehicle’s custom or factory paint. Our hail damage service with the use of paintless dent repair is the only way to maintain your paint finish to its original condition. Paintless dent repair for hail damage does not use Bondo® or any patchwork. Also, thanks to paintless dent repair there is a faster turnaround time that allows us to return your vehicle hail damage free, faster than ever. Hail damage repaired with the use of paintless dent repair must be done by a professional. Be wary of pop-up dent repair places after a hail storm. The seemingly cheap option could cause irreparable damage if they are not highly skilled. At Tucker’s Collision Center hail damage repair is performed by our expert technicians that have performed this exact service thousands of times over. If your windshield or other windows were chipped or cracked from the hail we have you covered. Learn more about our automotive glass repair and replacement services. The dents and chips that are left by a hail storm do not have to stay with you and your vehicle forever, Tucker’s Collision Center will make sure that whatever hail storm you got caught in is no longer visibly evident.